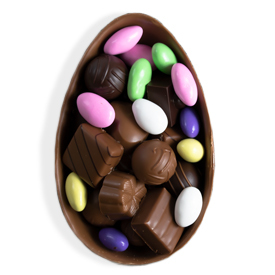 Our Boxed Half Egg is the perfect addition to any Easter Basket. 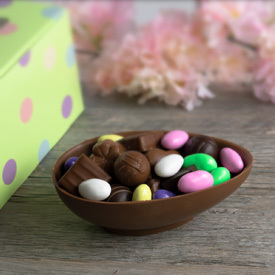 A mixed assortment of our most popular chocolates are nestled in a hand-poured Swiss milk chocolate half-egg shell along with a handful of colorful chocolate Jordan almonds. Presented in a polkadot windowed gift box.